That’s my boy, hiding out in there, waiting to reach out and snag someone with a claw. These trees should come with a warning. May attract ferocious purring kitty cats. So the holidays are done and cleaned up. And 2010…..isn’t feeling any less hectic than 2009. 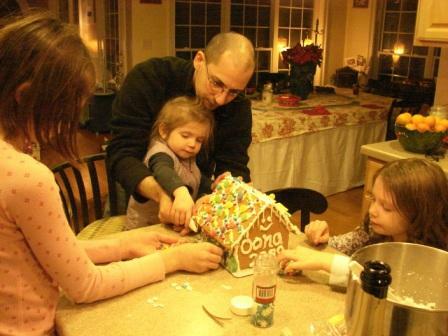 We kicked off the year by making a gingerbread house together (and then promptly eating it). Oona had a sugar high you’d have to see to believe. Later that evening Neve decided to try some of her stick – on rhinestone jewelry and got one stuck in her ear. Can I tell you how NOT fun that was? We spent a good half hour with a flashlight, peroxide and tweezers before I finally got the sucker out of there. I was afraid we were headed to the ER, because it looked at one point as though it was headed further in toward her ear drum. This is the same child who sat down to eat next to me a few days ago and remarked that she was surprised at all the gifts she got this year. Now, let me tell you – these kids got WAY less this year than in years past, and they even said as much on Christmas morning (Hey…..that’s it???). 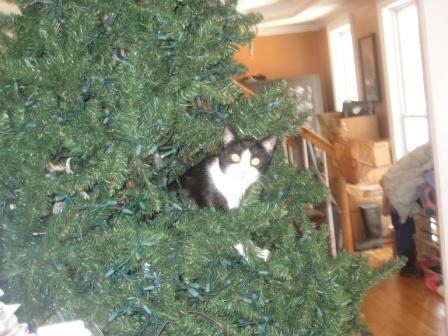 When I asker her to clarify, she said, Well I was really bad a lot this year. And I still got presents. I was beginning to panic a bit and I said Well maybe that’s why you got so much less this year. But you know what she said? Yeah but I was really bad and I still GOT presents! I guess Santa cut her some slack. I told her not to expect it two years in a row. Yikes. 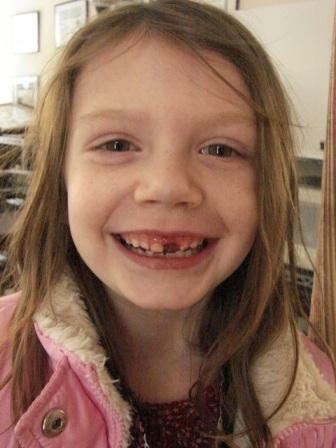 And still speaking of Neve…..she lost a tooth 2 nights ago. When we went to check on her to see if she’d fallen asleep yet she was wide awake in her bed with Sushi the cat laying on her chest, a paw in each of Neve’s hands while Neve had Sushi doing some sort of kitty conga. Sushi, the cat you can’t even look at without her running away. Putty in Neve’s hands. Paul said it’s because every evil genius needs a kitty cat. This entry was posted in Kids and tagged food, Pets. Bookmark the permalink. ← Once in a Blue Moon….